A team headed by Professor Adele Jones – an expert on social work and issues including child protection – includes Professor Minhua Ma, who has a global reputation in the field of serious games designed to bring about improvements in fields such as healthcare. 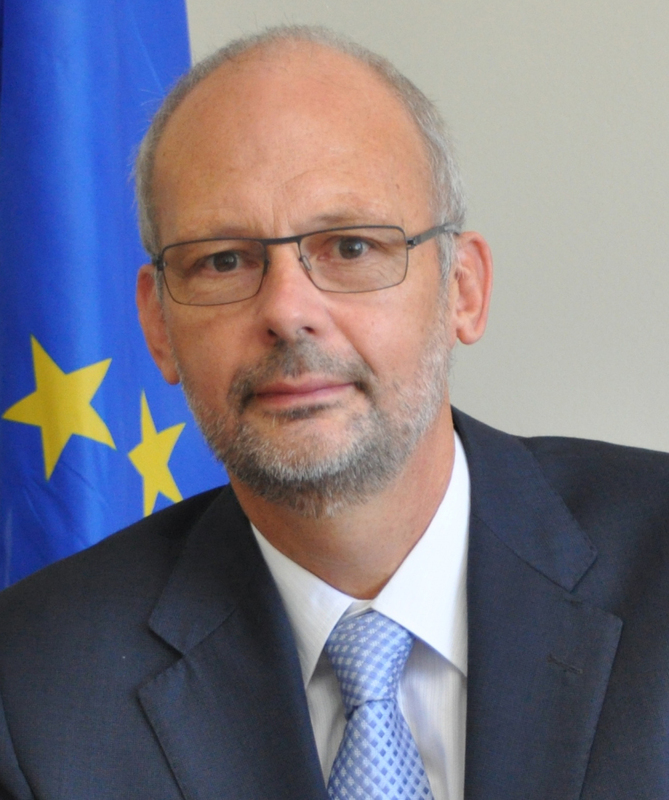 The inter-disciplinary group has now been awarded 400,000 euros via the European Union’s Delegation to the Eastern Caribbean Research Programme: Towards a Future Free from Domestic Violence. This will fund a multi-faceted investigation of domestic violence in the Caribbean countries of Grenada and Barbados. The research will be mirrored in the UK by another member of the team, Gill Kirkman, (pictured far right) who is Subject Leader in Social Work at the University’s School of Human and Health Sciences. Also taking part in the project is Reader in Criminal Psychology Dr Daniel Boduszek. Interpersonal violence iswidespread in the Eastern Caribbean, which may be a remnant of the violent colonisation history noted in the region. Although official statistics on the occurrence of interpersonal violence are collected in Barbados and Grenada, such acts tend to be under-reported. As such, the aim of this project was to gaina better insight intothe prevalence of violence victimisation and violence perpetration, as well as the level of acceptance ofinterpersonal violence, including gender-based violence (GBV),among girls and boys fromBarbados and Grenada. To overcomethe problem of under-reporting and to understand how violence is perceived from the children’s perspective, the current study used self-report, anonymous survey methodology . A team of Caribbean and European experts, headed by Professor Adele Jones from the University of Huddersfield, in partnership with The Sweet Water Foundation of Grenada, has been awarded 400,000 euros from the European Union to implement a new project on preventing domestic violence in the region. Data will be used to develop interactive, role-playing computer games designed to empower victims and change attitudes that have been linked to aggressive and violent behaviours. It is often claimed that computer games encourage violence, therefore the idea is to create computer games that can be used in schools to reduce negative attitudes developed in childhood and which can fuel domestic violence in later relationships. The Delegation of the European Union to Barbados and the Eastern Caribbean is proud to support this new project which aims to prevent domestic violence in the region. Although Caribbean governments have ratified international human rights conventions and policy and legislative reforms is ongoing, domestic violence is widely recognised as a persistent challenge. “This grant was awarded in response to a call issued by the EU delegation to Barbados and the Eastern Caribbean titled ‘towards a Future free from Domestic Violence’). None in three involves a multi-stakeholder partnership of civil society and governmental organisations. Though governments play a vital role in reducing domestic violence and as we show later, can and must lead in this, non-governmental organisations are the lifeblood of the fight to bring this scourge in our societies to an end. “Thank you very much for the welcome to the University on Friday and many congratulations on your European Researchers Night. I thought that it was tremendous from start to finish, there were so many children and families there who all clearly had a great time. You had many imaginative ideas, which worked very well I thought. The EU corner very clearly presented your impressive range of EU projects. Visitors were clearly very interested by the demonstration there of the virtual reality tool for tackling domestic violence. “The keynote lecture succeeded in putting a lot of what we all do into the overall policy context – actually two of the Nobel laureates mentioned were involved in the Marie Curie Actions earlier in their careers. Professor’s None-in-Three project shortlisted for national award. Professor Adele Jones’s domestic violence project is shortlisted in the NCCPE’s Engage competition. None in Three project wins UK national award! 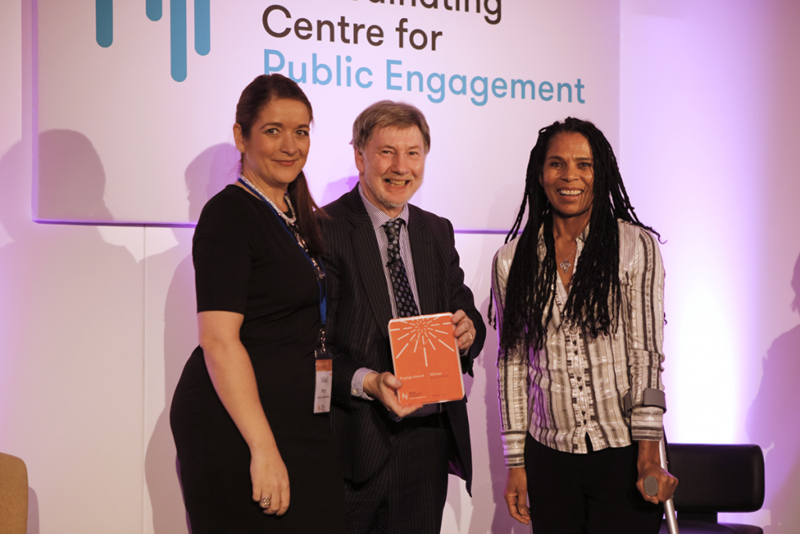 The None In Three project was selected from over 180 entries to win first prize for its impact and public engagment work at the.NCCPE’s Engage Competition on Monday 28th November 2016. The project was one of three finalists in the Health and Wellbeing category. The shortlisted work ranges from digitally reconstructing city histories to protecting endangered species; from working with older people as researchers to delivering hyper-local science festivals; from young children conducting their own research to influence the United Nations, to using theatre to improve oral health outcomes. The project wins a prize of £1,500 to go towards further public engagement work. expressed are solely those of the authors. Caribbean. UK: University of Huddersfield Press. Social work professor's domestic violence project wins major national award - EurekAlert! The EU funded None-in-Three project, directed by the University of Huddersfield’s Professor Adele Jones, was one of three projects shortlisted for the Health & Wellbeing award, in the Engage Competition run by the National Co-ordinating Centre for Public Engagement (NCCPE). that make this time of year special. I hope that this letter finds you enjoying all of the kinds of heat that the sun stirs up when it lounges directly above the equator. In Grenada, where I write from, we are a mere 12 degrees North and it has been roasting. Regardless, radio announcers have already started reminding us that the hurricane season is nigh and we must prepare for the heavy winds and rains that will imminently darken our skies. Pregnant women in Barbados are increasingly being abused by their partners, who set out to inflict as much injury as possible to both mother and unborn child, according to a recent survey. The European Union-funded study on domestic violence in the Caribbean, carried out in Barbados and Grenada between April and July last year among 109 participants, found alarming evidence that violence against women increased after they became pregnant. A TEAM at the University of Huddersfield have been given a multi million pound grant … to devise a computer game. on Skype to run through the final version of the Caribbean’s first “serious game”, Jesse. We did not yet know that the Huddersfield team would soon be awarded a new grant, as was announced on Friday, July 21st. Read more about the new developments in our “In the World” segment below, but following the Caribbean pilot, serious games will now be built for an additional 5 countries, under the Ni3 banner. A MULTI-MILLION pound research centre at a Yorkshire university may be the first in the world to explore the potential of computer games as an educational tool to reduce levels of violence against women and children. A NEW £4.6 million research centre that may be the first in the world to explore the potential of computer games as an educational tool to reduce levels of violence against women and children has been established at the University of Huddersfield. It is working on a global scale, having forged close links with experts and campaigners in China, Jamaica, Pakistan and Uganda as well as the UK. A new £4.6m research centre that may be the first in the world to explore the potential of computer games as an educational tool to reduce levels of violence has been established at the University of Huddersfield.